Professionals Paula Creamer and Morgan Pressel commit to the Meijer LPGA Classic for Simply Give. Creamer and Pressel partner with Meijer to produce a television advertisement for the tournament. The Grand Taste at the Meijer LPGA Classic is returning for a second year, and will be held June 16-18 during tournament week at Blythefield Country Club. 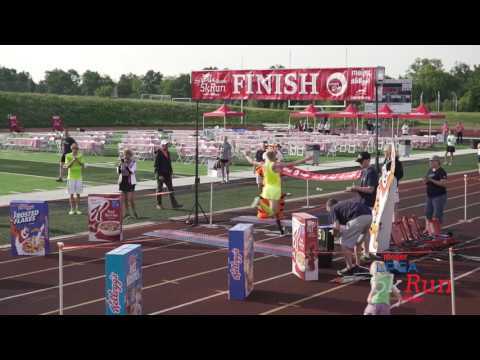 The Meijer LPGA 5k Run & Walk presented by Kellogg’s® brings the community together by featuring fun yet competitive challenges for the community, families, individuals and members of the media while benefiting the Meijer Simply Give program. 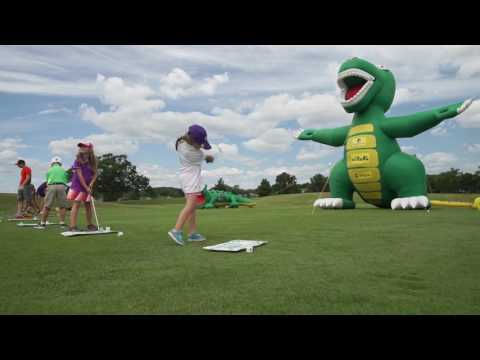 The Meijer LPGA Classic for Simply Give will once again engage young golf fans at Blythefield Country Club through a junior clinic, free admission and expanded activities during tournament week. The 2016 Meijer LPGA Classic for Simply Give was recognized as the “Best Tournament” on the LPGA Tour and continues to grow stronger with commitments from its three depending champions – Sei Young Kim, Lexi Thompson and Mirim Lee – who will return to Blythefield Country Club for the 2017 tournament. View from above the Blythefield Country Club course of the Meijer LPGA Classic for Simply Give. Grand Taste at the Meijer LPGA Classic, a three-day tasting event, will be held June 16-18. Women golfers playing in the Meijer LPGA Classic for Simply Give practice at Blythefield Country Club. A young volunteer looks around Blythefield Country Club in advance of the Meijer LPGA Classic for Simply Give. Golf carts are ready for the Meijer LPGA Celebrity Pro-Am at Egypt Valley Country Club. Celebrity Pro-Am players at Egypt Valley Country Club, including Doug Meijer and former NFL player Dhani Jones. Doug Meijer speaks with sponsor exemption player August Kim, of Purdue University. Celebrity Pro-Am players at Egypt Valley Country Club, including Meijer CEO & President Rick Keyes and Detroit Lions owner Rod Wood. Celebrity Pro-Am players celebrate at Egypt Valley Country Club. Celebrity Pro-Am players at Egypt Valley Country Club. ESPN’s Herm Edwards plays at the Meijer LPGA Celebrity Pro-Am. 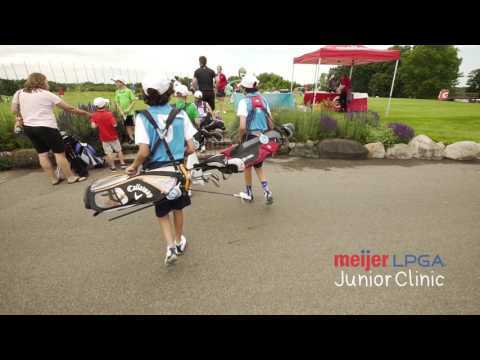 Children attend a Meijer LPGA Junior Clinic at Egypt Valley Country Club. Doug Meijer and LPGA pro golfers welcome children at the Meijer LPGA Junior Clinic. Golf carts lined up and ready for the Meijer LPGA Classic Official Pro-Am at Blythefield Country Club. Golfer hits out of a sand bank at Blythefield Country Club. Meijer LPGA Classic Official Pro-Am players celebrate a putt at Blythefield Country Club. The Meijer LPGA Classic for Simply Give runs June 13-18 at Blythefield Country Club. Meijer LPGA Classic Official Pro-Am players, including Meijer CEO & President Rick Keyes, at Blythefield Country Club. Meijer LPGA Official Pro-Am players walk the course in front of the Grand Taste tent. Meijer LPGA Classic players warm up at the putting green at Blythefield Country Club. LPGA pro Cheyenne Woods greets a fan at Blythefield Country Club. Meijer LPGA Classic Official Pro-Am golfers play at Blythefield Country Club. Meijer LPGA Classic 2015 Champion Lexi Thompson plays during the Meijer LPGA Official Pro-Am. LPGA pro Morgan Pressel plays during the Meijer LPGA Official Pro-Am. Meijer LPGA Classic Official Pro-Am golfers play at Blythefield Country Club, including Doug Meijer and LPGA pro Cheyenne Woods. Doug Meijer plays at the Meijer LPGA Official Pro-Am at Blythefield Country Club. LPGA pro Jennifer Ha at the Meijer LPGA Classic for Simply Give. A Meijer LPGA Classic for Simply Give caddy wipes a club. LPGA pro Lexi Thompson at the Meijer LPGA Classic for Simply Give. Two volunteers quiet the crowd at Blythefield Country Club. Meijer LPGA pro Ariya Jutanugarn takes a picture with a fan at the Meijer LPGA Classic for Simply Give. A volunteer at the Grand Taste at the Meijer LPGA Classic, a three-day food tasting event. The Grand Taste at the Meijer LPGA Classic is a three-day food tasting event held at Blythefield Country Club. Celebrity Chef Dean Fearing with LPGA pro Morgan Pressel at the Grand Taste. An LPGA pro at early-morning driving practice at Blythefield Country Club. A crowd gathers at the 18th hold of the Meijer LPGA Classic for Simply Give. LPGA pro Aditi Ashok at the Meijer LPGA Classic for Simply Give. Little fans attend the Meijer LPGA Classic for Simply Give at Blythefield Country Club. Meijer LPGA pro Ariya Jutanugarn at the Meijer LPGA Classic for Simply Give. Volunteers walk the Blythefield Country Club course in front of the Grand Taste tent. Celebrity Chef Dean Fearing presents a cooking demo at the Grand Taste preview night. Green Bay Packers coach Mike McCarthy poses with the “Cheese Lady” and a cheese head version of himself at the Grand Taste.